Prime Minister Narendra Modi officially declared open the much-awaited Kollam bypass on National Highway-66 in Kollam on Tuesday. 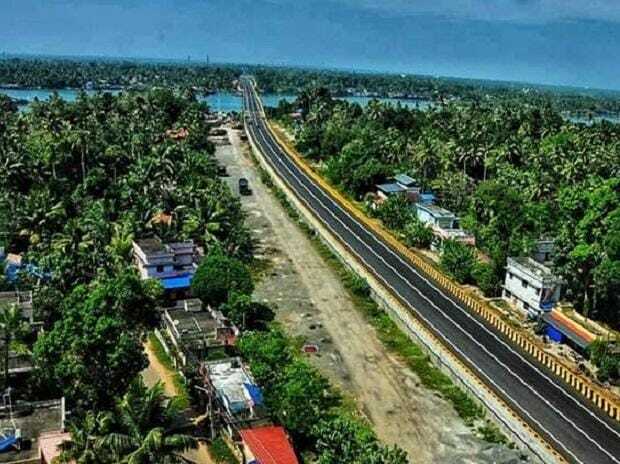 The 13-km-long, two-lane bypass, with a project cost of Rs 352 crore, will cut the travel time between Alappuzha and Thiruvananthapuram districts of Kerala and is expected to decongest the traffic in Kollam town. The bypass has three major bridges over the Ashtamudi Lake, with a total length of 1,540 metres. Dedicating the bypass to the nation, Modi said only 56 per cent of the rural habitat was connected with roads in the country when he came to power in 2014. "On the banks of the Ashtamudi lake, I sense the recovery from the (August, 2018) floods. But we will have to fight harder. I congratulate you all on the completion of the bypass," he said. "In our country, we often see many infrastructure projects getting stalled after inauguration. A huge amount of public money goes to waste," the prime minister said, adding that he evaluated the development projects and engaged in meetings with all departmental secretaries and state chief secretaries. "Some projects get delayed for more than 20-30 years. It is a crime towards the common people," he said. The prime minister said foreign tourist arrivals went up in the country from 70 lakh in 2013 to one crore in 2017, adding that foreign exchange earned due to tourism went up from $18 billion to $27 billion in the said period. "India was among one of the fastest-growing tourist destinations in the world in 2017," he said. Kerala Chief Minister Pinarayi Vijayan said his government had fulfilled the development promises made to the prime minister when it came to power in the state. "Now I can proudly say that Kerala has fulfilled the promise given to the prime minister when we came to power. All these developments are for the welfare of the people," he said. This was the prime minister's third official visit to Kollam. Modi's first visit to the district was in December 2015, when he had unveiled the statue of former Kerala chief minister R Sankar. He had also visited Kollam in April 2016, hours after the Puttingal fire tragedy that claimed over 100 lives. Modi, who earlier arrived at Thiruvananthapuram in a special plane, was welcomed by Kerala Governor Justice (retd) P Sathasivam, Vijayan, officials and other leaders. He subsequently arrived at Kollam in a helicopter.